The diaphragm tank has been developed to allow the systems air cushion to be separated from the system’s water. No waterlogging of the tank can occur as the air is held between the tank wall and the outside of a bladder placed inside the tank, while the system water is contained inside the bladder. This changes the system to an air elimination system, as any air extracted from the system water is passed out of the system into the atmosphere. The diaphragm cannot be replaced if the tank fails. The advantage of this style is the initial cost. 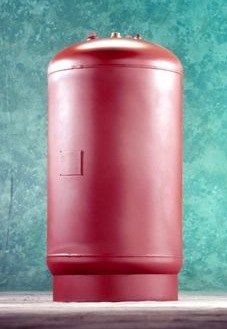 On smaller tanks the cost of replacing the bladder may exceed the cost of replacing the tank.